Dave & Buster's Entertainment, Inc. PLAY reported better-than-expected earnings and revenues for the third quarter of fiscal 2018. Adjusted earnings of 30 cents surpassed the Zacks Consensus Estimate of 21 cents by 42.9%. The bottom line also grew 3.4% year over year. Results were aided by solid segmental revenues and consistent unit growth. 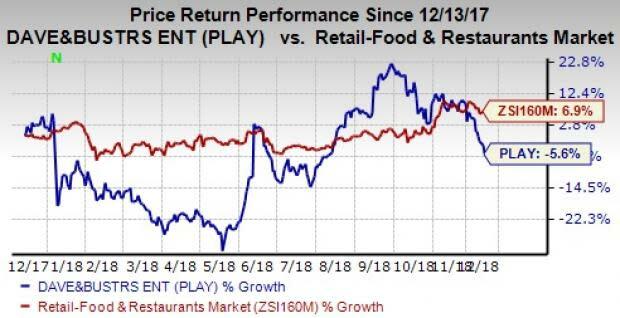 Despite earnings beat, some moderate changes in fiscal 2018 guidance may have led Dave & Buster’s shares to dip 2.8% on Dec 11. The company’s shares have also declined 5.6% over the past year against the industry’s rally of 6.9%. Quarterly revenues of $282.1 million outpaced the consensus mark by 2.9%. The top-line figure increased 12.9% from the prior-year quarter. The top line was primarily favored by consistent unit growth. Overall comps declined 1.3% in the fiscal third quarter, same as what was recorded in the year-ago quarter. The decline in comps can be attributed to a 0.7% dip in walk-in sales and a decline of 6.9% in special events sales. Comps at Amusements & Other increased 1.5% but decreased 5% in Food & Beverage. Non-comparable store revenues in the reported quarter increased 135.5% from the year-ago quarter to $75 million. Food and Beverage revenues (42.1% of total revenues in the fiscal third quarter) increased 10.3% year over year to $118.8 million while Amusement and Other revenues (57.9%) rose 14.8% to $163.3 million. In the reported quarter, operating margin declined roughly 250 basis points (bps) year over year to 5.5%. Net income in the fiscal third quarter totaled $11.9 million, down from $12.2 million in the prior-year quarter. Adjusted EBITDA decreased 2.7% to $52.7 million compared with $54.1 million in the same period last year. However, EBITDA margin decreased 300 bps year over year. As of Nov 4, 2018, cash and cash equivalents were $19.7 million compared with $18.8 million as of Feb 4, 2018. Long-term debt totaled $368.2 million at the end of the reported quarter, up from $351.2 million at the end of fiscal 2017. During the fiscal third quarter, the company repurchased roughly 437,000 shares for $25 million, with an additional 149,000 shares for $8.8 million through Dec 4. As of the same date, cumulatively, management repurchased 5.1 million shares for $275.6 million under the $400-million share repurchase authorization. Dave & Buster’s launched one store during the fiscal third quarter in Harrisburg, PA. In the fourth quarter, the company has already opened stores in Milford, CT, and Birmingham, AL. By the end of the fiscal year, the company plans to open its final store in Corpus Christi, TX. It currently has 12 units under construction. Dave & Buster’s expects 2018 revenues of $1.243-$1.255 billion, up from $1.230-$1.255 billion mentioned previously. Comps are still anticipated to decrease by a low-single digit. Net income is anticipated to come in between $106 million and $113 million, up from $101-$111 million mentioned earlier. The company informs that it will open 15 stores, representing 14% unit growth in fiscal 2018. The stores will include one large, two small and two 17K format stores. McDonald's MCD reported impressive third-quarter 2018 results, wherein earnings per share of $2.10 surpassed the consensus mark of $1.98 by 6.1% and increased 19% from the year-ago quarter. Domino's DPZ reported mixed quarterly numbers for third-quarter 2018, wherein earnings of $1.95 per share outpaced the consensus mark of $1.73 and increased 53.5% on a year-over-year basis. Restaurant Brands QSR reported lower-than-expected results in third-quarter 2018. Adjusted earnings of 63 cents per share missed the consensus mark by a couple of cents. However, the reported figure increased 8.6% from the year-ago quarter.